Yesterday we went to visit Derek and Amanda. They put me in a funny puffy T-shirt with wings. 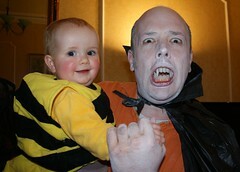 When daddy turned up he painted himself white and put in some pointed teeth. I could see it was daddy so I couldn't understand why Pudge was scared and Gordy and his friehds looked so worried. I didn't think he was frightening at all.